But it’s nothing a slice of this heavenly cake can’t help. I have found that I quite enjoy a loaf cake. They are frosting-less (yes! ), portable, and a no-brainer to slice. I had a tense few moments when I smelled something burning and opened my oven door (it doesn’t have a window) to see batter overflowing and plopping onto the bottom, but fortunately, the cake was set enough where I was able to remove it, clean it up a bit, and put it back in. I knew there was too much batter but I was stubborn and told myself that the recipe wouldn’t have made that much if it wasn’t necessary, so I poured it all in. It’s the same part of my brain that says if I am crossing the street on a cross walk I don’t really have to “be careful” because cars have to stop for cross walks. A seasoned jaywalker (like myself) will know what I am talking about, but it turns out that kind of logic doesn’t matter if a car hits you. Or if you end up with an ugly loaf because you had a heavy hand with the batter and had to take it out mid-bake for some cosmetic adjustments. Oh well. It still tasted terrific, and the taste of the pineapple and coconut were a reminder that it won’t always be so cold and messy outside. I shared with my coworkers and I think they enjoyed it, too. Before posting the recipe, I do have a small announcement…this will be the last proper “Acorns and Apples” update! With my next post I will be launching a new name and sharing what I hope to focus on a bit more going forward. 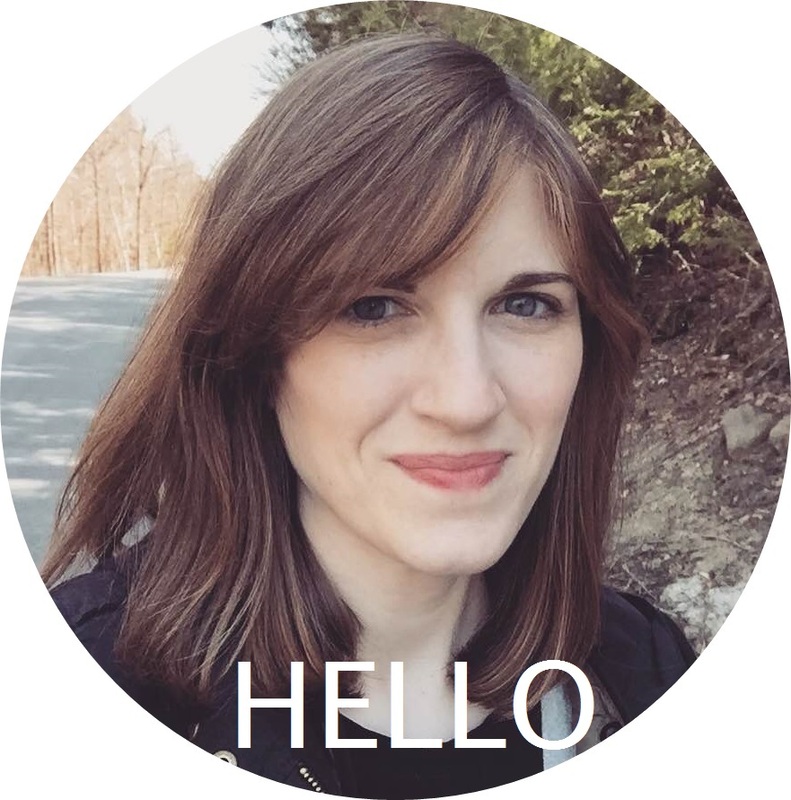 I am super excited and I hope you will continue to follow along – I can honestly say I have never enjoyed any project as much as I enjoy this one, and being a part of this community. Stay tuned, and have a terrific weekend! Preheat the oven to 350 degrees and prepare a 9×5 loaf pan with baking spray or butter/flour. On a rimmed baking sheet, spread the spread the coconut in an even layer and bake until toasted (6-10 minutes), tossing occasionally. In a large bowl, cream butter and sugar together until light and fluffy (around 4 minutes) with an electric mixer on high speed. Add eggs one at a time, stopping between each to scrape the bowl with a rubber spatula. Reduce speed to low and add the flour mixture in 3 batches, alternating it with the sour cream. Mix until just combined. Do not overmix. 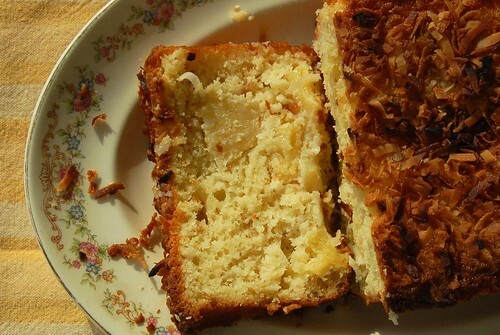 Using a rubber spatula, fold in the pineapple chunks and 1 cup of the toasted coconut. Transfer batter to prepared loaf pan, smooth the top and sprinkle with remaining coconut. Bake for 65 – 70 minutes, or until a toothpick inserted into the center comes out clean. 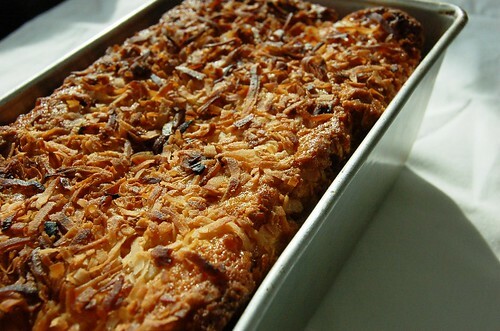 You may want to tent the loaf with foil halfway through baking to keep the coconut from becoming “extra crispy”. Let the cake cool in the pan for 15 minutes before removing it and placing it on a wire rack to cool completely. This is one dense, moist loaf cake. While I love the pineapple, I felt that the pieces were too large. I would suggest using crushed pineapple, or cutting up chunks or slices of pineapple into a small dice. I would further suggest removing excess moisture from the fruit by wrapping it in some paper towels before adding it to the batter. That might help with the moistness. I’m sorry that used both “moist” and “moistness”, but I had to. I love the recipe. I can eat coconut all say. The crisp shreds on top look perfect. Thanks for the post. I am so over Winter already and definitely looking forward to Spring and Summer. I have created a whole to do list when the weather is nice outside so now I am just counting down the days! Also, I tried your Tomato Gravy this morning and it was incredibly delicious! Everyone loved it, thanks for the recipe! How are we going to know your new website name? Will you just link it? Great idea about the list, Fatima! It’s nice to have things to look forward to…I should make one, too! So glad you liked to tomato gravy! Since I posted that my cousin’s husband Ben (who made it for me the first time) has given me a copy of his orignal family recipe (!!!) so I will me making that version sometime soon…I know it will be super delicious, and extra special because of it’s history. Also, I like that you got moist + loaf in one sentence. Hope you’re coping with all of the snow! And omg, my typos are getting worse by the day. Great new blog design, love it!! 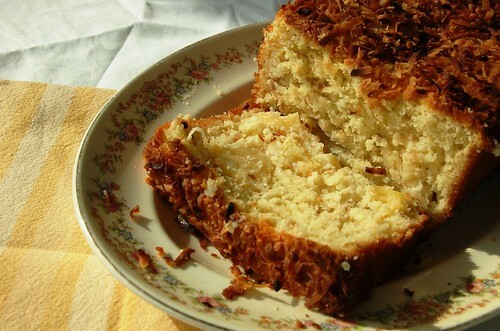 I’m not usually a huge fan of coconut but this bread looks really good and super moist. And I agree with you, I totally miss summery flavors..they seem SO far away! I noticed your recipe because it was one I ‘d love to try. Sounds great, especially in the coldness of Winter. Thanks for the inspiration! Hi Wendy! Thanks so much for visiting! Let me know how it turns out if you make it – the flavors are definitely a nice reminder that summer will come back…eventually! I sure could use some summery flavors too! And I did the exact same thing with a gingerbread loaf… knew there was too much batter, put it all in anyways, and found it overflowing and making a huge mess of my oven! Also, gingerbread loaf sounds yummy. I should put that on my list for summer when I want to evoke a little cozy holiday spirit!